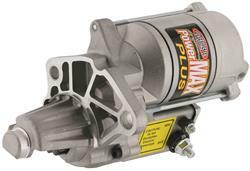 Purchased for my Plymouth with 440-6 since my factory starter just did not have the torque to start my car without cranking for what seemed like hours. This is a direct fit, very simple installation. This thing is nuts! It spins at such high rpm it started my car up right away! Highly impressed. And as usual summit delivered it fast! The right product the right application and perfect fit. Nice quality. Fit between headers easily from top. Haven’t used it to start car yet. 440/a-body mopar.